So – this is home. A three-bedroom, two-bath bungalow on Calle 467, between 17th and 19th. 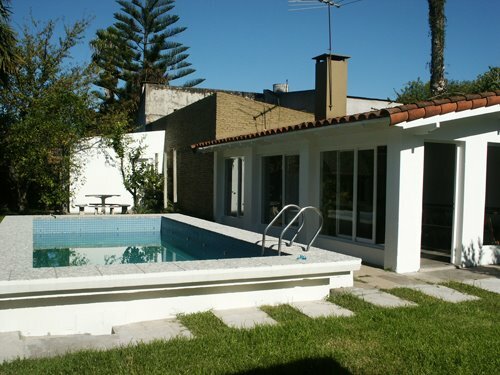 Usually rented during the summer months when rich folks flee the urban heat of Buenos Aires and seek respite in a mellower town. Comes complete with furniture, cable TV, pool, large parilla/grill, lime and avocado trees, and one large cucaracha (or perhaps more than one, but I try not to notice). 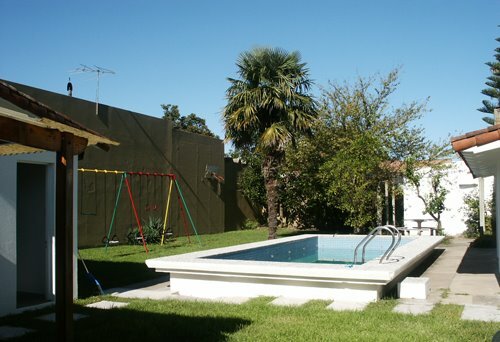 Parillas (pronounced “parijhaz” in Argentine Spanish) are mainstay elements in Argentine backyards. Used to cook meat (beef, and an occasional chicken for diversity’s sake) during the rite of grilling, often on Sunday afternoons but sometimes every day. Ours is particularly large and situated in its own small house; here’s Chris getting the charcoal started. Also some other pics of our kid-friendly yard. >Hi everyone. Glad the trip was mostly uneventful. Wow, the house is great. So when is the open house with the fresh guacamole? What another great opportunity for the Sinton Family! I hope Emily, Eric, and Julia post something about friends they meet and activities they participate in. >I’m so glad you’re doing a blog so I can live vicariously through you! You do such a nice job of visualizing your experiences.I was thinking of you the other day as “the ladies” planned our next hiking trip — this one in the Catskills at the end of May. We’re planning an overseas trip to Germany to hike in the Alps sometime Summer 2009. But if that falls through we should go to California and see you! >The house looks fantastic! 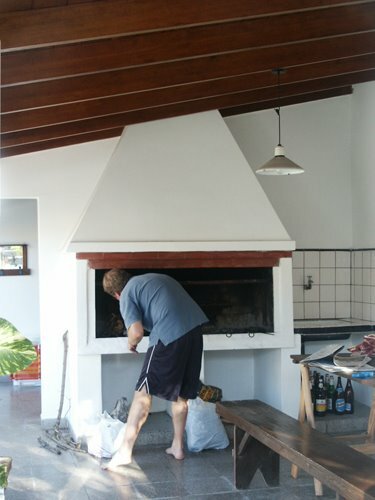 And the grill … at first I thought Chris was stoking a fireplace. How many pounds of beef does the average Argentinian eat during a given day? >Great pics…looks like you’re having fun already. We’ll be down next week with a bus load of friends…can Chris fire up the parilla for some sizzling carne asada with some tequila coolers on the side? Looking forward to what Eric, Emily and Julia think of City Bell and their long flight.